This article is about the film studio. For the cinema chain, see Regal Entertainment Group. For the former record label, see United Artists Records. United Artists Corporation (UA), currently doing business as United Artists Digital Studios, is an American film and television entertainment studio. Founded in 1919 by D. W. Griffith, Charlie Chaplin, Mary Pickford, and Douglas Fairbanks, the studio was premised on allowing actors to control their own interests, rather than being dependent upon commercial studios. UA was repeatedly bought, sold, and restructured over the ensuing century. The current United Artists company exists as a successor to the original; as a distributor of films across MGM and third-party titles and as a provider of digital content, in addition to handling most of its post-1952 in-house library and other content it has since acquired. Metro-Goldwyn-Mayer acquired the studio in 1981 for a reported $350 million ($1.0 billion today). On September 22, 2014, MGM acquired a controlling interest in Mark Burnett and Roma Downey's entertainment companies One Three Media and Lightworkers Media, then merged them to revive United Artists' TV production unit as United Artists Media Group (UAMG). However, on December 14 of the following year, MGM wholly acquired UAMG and folded it into MGM Television. UA was revived yet again in 2018 as United Artists Digital Studios. Mirror, the joint distribution venture between MGM and Annapurna Pictures was renamed as United Artists Releasing in early February 2019 just in time for UA's 100th anniversary. Pickford, Chaplin, Fairbanks, and Griffith incorporated UA as a joint venture on February 5, 1919. Each held a 25 percent stake in the preferred shares and a 20 percent stake in the common shares of the joint venture, with the remaining 20 percent of common shares held by lawyer and advisor William Gibbs McAdoo. The idea for the venture originated with Fairbanks, Chaplin, Pickford and cowboy star William S. Hart a year earlier. Already Hollywood veterans, the four stars talked of forming their own company to better control their own work. They were spurred on by established Hollywood producers and distributors who were tightening their control over actor salaries and creative decisions, a process that evolved into the studio system. With the addition of Griffith, planning began, but Hart bowed out before anything was formalized. When he heard about their scheme, Richard A. Rowland, head of Metro Pictures, apparently said, "The inmates are taking over the asylum." The four partners, with advice from McAdoo (son-in-law and former Treasury Secretary of then-President Woodrow Wilson), formed their distribution company. Hiram Abrams was its first managing director, and the company established its headquarters at 729 Seventh Avenue in New York City. The original terms called for each star to produce five pictures a year. By the time the company was operational in 1921, feature films were becoming more expensive and polished, and running times had settled at around ninety minutes (eight reels). The original goal was thus abandoned. Griffith, Pickford, Chaplin (seated), and Fairbanks at the signing of the contract establishing the United Artists motion-picture studio in 1919. By 1924, Griffith had dropped out, and the company was facing a crisis; the alternatives were to either bring in others to help support a costly distribution system or concede defeat. Veteran producer Joseph Schenck was hired as president. He had produced pictures for a decade, and brought commitments for films starring his wife, Norma Talmadge, his sister-in-law, Constance Talmadge, and his brother-in-law, Buster Keaton. Contracts were signed with independent producers, including Samuel Goldwyn, and Howard Hughes. In 1933, Schenck organized a new company with Darryl F. Zanuck, called Twentieth Century Pictures, which soon provided four pictures a year, forming half of UA's schedule. Schenck formed a separate partnership with Pickford and Chaplin to buy and build theaters under the United Artists name. They began international operations, first in Canada, and then in Mexico. By the end of the 1930s, United Artists was represented in over 40 countries. When he was denied an ownership share in 1935, Schenck resigned. He set up 20th Century Pictures' merger with Fox Film Corporation to form 20th Century Fox. Al Lichtman succeeded Schenck as company president. Other independent producers distributed through United Artists in the 1930s including Walt Disney Productions, Alexander Korda, Hal Roach, David O. Selznick, and Walter Wanger. As the years passed, and the dynamics of the business changed, these "producing partners" drifted away. Samuel Goldwyn Productions and Disney went to RKO and Wanger to Universal Pictures. In the late 1930s, UA turned a profit. Goldwyn was providing most of the output for distribution. He sued United several times for disputed compensation leading him to leave. MGM's 1939 hit Gone with the Wind was supposed to be a UA release except that Selznick wanted Clark Gable, who was under contract to MGM, to play Rhett Butler. Also that year, Fairbanks died. UA became embroiled in lawsuits with Selznick over his distribution of some films through RKO. Selznick considered UA's operation sloppy, and left to start his own distribution arm. In the 1940s, United Artists was losing money because of poorly received pictures. Cinema attendance continued to decline as television became more popular. The company sold its Mexican releasing division to Crédito Cinematográfico Mexicano, a local company. In 1941, Pickford, Chaplin, Disney, Orson Welles, Goldwyn, Selznick, Alexander Korda, and Wanger—many of whom were members of United Artists--formed the Society of Independent Motion Picture Producers (SIMPP). Later members included Hunt Stromberg, William Cagney, Sol Lesser, and Hal Roach. The Society aimed to advance the interests of independent producers in an industry controlled by the studio system. SIMPP fought to end ostensibly anti-competitive practices by the seven major film studios—Loew's (MGM), Columbia Pictures, Paramount Pictures, Universal Pictures, RKO Radio Pictures, 20th Century Fox, and Warner Bros./First National—that controlled the production, distribution, and exhibition of motion pictures. By 1958, SIMPP achieved many of the goals that led to its creation, and the group ceased operations. Needing a turnaround, Pickford and Chaplin hired Paul V. McNutt, a former governor of Indiana, as chairman and Frank L. McNamee as president. McNutt did not have the skill to solve UA's financial problems and the pair was replaced after only a few months. On February 16, 1951, lawyers-turned-producers Arthur B. Krim (of Eagle-Lion Films) and Robert Benjamin approached Pickford and Chaplin with a wild idea: let them take over United Artists for ten years. If, at the end of those years, UA was profitable, they would own half the company. Fox Film Corporation president Spyros Skouras extended United Artists a $3 million loan through Krim and Benjamin's efforts. In taking over UA, Krim and Benjamin created the first studio without an actual "studio". Primarily acting as bankers, they offered money to independent producers. UA leased space at the Pickford/Fairbanks Studio but did not own a studio lot. Thus UA did not have the overhead, the maintenance, or the expensive production staff at other studios. With the instability in the film industry due to theater divestment, the business was considered risky. In 1955, movie attendance reached its lowest level since 1923. Chaplin sold his 25 percent share during this crisis to Krim and Benjamin for $1.1 million, followed a year later by Pickford who sold her share for $3 million. United Artists went public in 1957 with a $17 million stock and debenture offering. The company was averaging 50 films a year. In 1958, UA acquired Ilya Lopert's Lopert Pictures Corporation, which released foreign films that attracted criticism or had censorship problems. In 1959, after failing to sell several pilots, United Artists offered its first ever television series, The Troubleshooters, and later released its first sitcom, The Dennis O'Keefe Show. In the 1960s, mainstream studios fell into decline and some were acquired or diversified. UA prospered while winning 11 Academy Awards, including five for best picture, adding relationships with the Mirisch brothers, Billy Wilder, Joseph E. Levine and others. In 1961, United Artists released West Side Story, which won a record ten Academy Awards (including Best Picture). In 1960, UA purchased Ziv Television Programs. UA's television division was responsible for shows such as Gilligan's Island, The Fugitive, Outer Limits, and The Patty Duke Show. The television unit had begun to build up a profitable rental library, including Associated Artists Productions, owners of Warner Bros. pre-1950[note 1] features, shorts and cartoons and 231 Popeye cartoon shorts purchased from Paramount Pictures in 1958, becoming United Artists Associated, its distribution division. In 1963, UA released two Stanley Kramer films, It's A Mad, Mad, Mad, Mad World and A Child Is Waiting. In 1964, UA introduced U.S. film audiences to the Beatles by releasing A Hard Day's Night (1964) and Help! (1965). At the same time, it backed two expatriate North Americans in Britain, who had acquired screen rights to Ian Fleming's James Bond novels. For $1 million, UA backed Harry Saltzman and Albert Broccoli's Dr. No in 1963 and launched the James Bond franchise. The franchise outlived UA's time as a major studio, continuing half a century later. Other successful projects backed in this period included the Pink Panther series, which began in 1964, and Spaghetti Westerns, which made a star of Clint Eastwood. In 1964, the French subsidiary, Les Productions Artistes Associés, released its first production That Man from Rio. The second United Artists logo, used during the company's sale to Transamerica from 1967 until 1982. On the basis of its film and television hits, in 1967, Transamerica Corporation purchased 98 percent of UA's stock. Transamerica selected David and Arnold Picker to lead its studio. UA debuted a new logo incorporating the parent company's striped T emblem and the tagline "Entertainment from Transamerica Corporation". This wording was later shortened to "A Transamerica Company". The following year, in 1968, United Artists Associated was reincorporated as United Artists Television Distribution. UA released another Best Picture Oscar winner in 1967, In the Heat of the Night and a nominee for Best Picture, The Graduate, an Embassy production that UA distributed overseas. In 1970, UA lost $35 million; thus the Pickers were pushed aside for the return of Krim and Benjamin. Other successful pictures included the 1971 screen version of Fiddler on the Roof. However, the 1972 film version of Man of La Mancha was a failure. New talent was encouraged, including Woody Allen, Robert Altman, Sylvester Stallone, Saul Zaentz, Miloš Forman, and Brian De Palma. In 1973, United Artists took over the sales and distribution of MGM's films in Anglo-America until the latter bought UA in 1981 due to the massive losses from Heaven's Gate. Cinema International Corporation assumed international distribution rights for MGM's films and carried on to United International Pictures (made from CIC and UA's International assets being owned by partner MGM) in the 1980s. In 1975, Harry Saltzman sold UA his 50 percent stake in Danjaq, the holding-company for the Bond films. UA was to remain a silent partner, providing money, while Albert Broccoli took producer credit. Danjaq and UA remained the public co-copyright holders for the Bond series, and the 2006 Casino Royale remake shares the copyright with Columbia Pictures. UA released One Flew Over the Cuckoo's Nest in 1975 a film which won the Best Picture Academy Award and earned $56 million. UA followed with the next two years' Best Picture Oscar winners, Rocky and Annie Hall. However, Transamerica was not pleased with UA's releases such as Midnight Cowboy and Last Tango in Paris that were rated X by the Motion Picture Association of America. In these instances, Transamerica demanded the byline "A Transamerica Company" be removed on the prints and in all advertising. At one point, the parent company expressed its desire to phase out the UA name and replace it with Transamerica Films. Krim tried to convince Transamerica to spin off United Artists, but he and Transamerica's chairman could not come to an agreement. Finally in 1978, following a dispute with Transamerica chief John R. Beckett over administrative expenses, UA's top executives, including chairman Krim, president Eric Pleskow, Benjamin and other key officers walked out. Within days they announced the formation of Orion Pictures, with backing from Warner. The departures concerned several Hollywood figures enough that they took out an ad in a trade paper warning Transamerica that it had made a fatal mistake in letting them go. Transamerica inserted Andy Albeck as UA's president. United had its most successful year with four hits in 1979: Rocky II, Manhattan, Moonraker, and The Black Stallion. The new leadership agreed to back Heaven's Gate, a project of director Michael Cimino, which vastly overran its budget and cost $44 million. This led to the resignation of Albeck who was replaced by Norbert Auerbach. United Artists recorded a major loss for the year due almost entirely to the box-office failure of Heaven's Gate. It destroyed UA's reputation with Transamerica and the greater Hollywood community. However, it may have saved the United Artists name, as UA's final head before the sale, Steven Bach, wrote in his book Final Cut that there was talk about renaming United Artists to Transamerica Pictures. In 1980, Transamerica decided to exit the film making business, and put United Artists on the market. Kirk Kerkorian's Tracinda Corp. purchased the company in 1981. Tracinda also owned Metro-Goldwyn-Mayer. In 1981, United Artists Classics, which had formerly been a division of the company that re-released library titles, was turned into a first-run art film distributor by Nathaniel T. Kwit, Jr. Tom Bernard was hired as the division's head of sales and Ira Deutchman as head of marketing. Later the division added Michael Barker and Donna Gigliotti. Deutchman left to form Cinecom, and Barker and Bernard formed Orion Classics and Sony Pictures Classics. The label mostly released foreign and independent films such as Ticket to Heaven and The Grey Fox, and occasional first-run reissues from the UA library, such as director's cuts of Head Over Heels and Cutter's Way. When Barker and Bernard left to form Orion, the label was briefly rechristened MGM/UA Classics before it ceased operating in the late 1980s. The merged companies became MGM/UA Entertainment Company and in 1982 began launching new subsidiaries: the MGM/UA Home Entertainment Group, MGM/UA Classics and MGM/UA Television Group. Kerkorian also bid for the remaining, outstanding public stock, but dropped his bid, facing lawsuits and vocal opposition. After the purchase, David Begelman's duties were transferred from MGM to MGM/UA. Under Begelman, MGM/UA produced unsuccessful films and he was fired in July 1982. Of the 11 films he put into production, by the time of his termination only Poltergeist proved to be a hit. As part of the consolidation, in 1983, MGM closed and marketed United Artists' long time headquarters at 729 Seventh Avenue in New York City. On August 7, 1985, Ted Turner announced that his Turner Broadcasting System would buy MGM/UA. As film licensing to television became more complicated, Turner saw the value of acquiring MGM's film library for his superstation WTBS. Under the terms of the deal, Turner would immediately sell United Artists back to Kerkorian. In anticipation, Kerkorian installed film producer Jerry Weintraub as the chairman and chief executive of United Artists Corporation in November 1985. Former American Broadcasting Company executive Anthony Thomopoulos was recruited as UA's president Weintraub's tenure at UA was brief; he left the studio in April 1986, replaced by former Lorimar executive Lee Rich. On March 25, 1986, Turner finalized his acquisition of MGM/UA in a cash-stock deal for $1.5 billion and renamed it MGM Entertainment Co. Kerkorian then repurchased most of United Artists' assets for roughly $480 million. 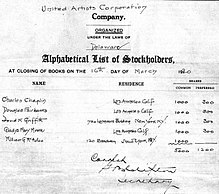 As a result of this transaction, the original United Artists ceased to exist. Kerkorian, for all intents and purposes, created an entirely new company implementing the inherited assets; thus, the present day UA is not the legal successor to the original incarnation, though it shares similar assets. Logo from 1987 to 1994. Due to financial community concerns over his debt load, Ted Turner was forced to sell MGM's production and distribution assets to United Artists for $300 million on August 26, 1986. The MGM lot and lab facilities were sold to Lorimar-Telepictures. Turner kept the pre-May 1986 MGM film and television library, along with the Associated Artists Productions library, Gilligan's Island and its animated spin-offs, and the RKO Pictures films that United Artists had previously purchased. United Artists was renamed MGM/UA Communications Company (MUCC) and organized into three main units: one television production and two film units. David Gerber headed up the TV unit with Anthony Thomopoulous at UA, and Alan Ladd, Jr. at MGM. Despite a resurgence at the box office in 1987 with Spaceballs, The Living Daylights, and Moonstruck, MUCC lost $88 million. In April 1988, Kerkorian's 82 percent of MUCC was up for sale. MGM and UA were split by July. Eventually, 25 percent of MGM was offered to Burt Sugarman, and producers Jon Peters and Peter Guber, but the plan fell-through. Rich, Ladd, Thomopoulous and other executives grew tired of Kerkorian's antics and began to leave. By summer 1988, the mass exodus of executives started to affect productions, with many film cancellations. The 1989 sale of MGM/UA to the Australian company Qintex/Australian Television Network (owners of the Hal Roach library, which both MGM and UA had distributed in the 1930s) also fell-through, due to the company's bankruptcy later that year. On November 29, 1989, Turner Broadcasting System (the owners of the pre-May 1986 MGM library) attempted to buy entertainment assets from Tracinda Corporation, including MGM/UA Communications Co. (which also included United Artists, MGM/UA Home Video, and MGM/UA Television Productions), but failed. UA was essentially dormant after 1990 and released no films for several years. Eventually, in 1990, Italian promoter Giancarlo Parretti purchased UA. He purchased a small company and renamed it Pathé Communications anticipating a successful purchase of Pathé, the original French company. But his attempt failed and instead he merged MGM/UA with his former company, resulting in MGM-Pathé Communications Co. During the transaction, Parretti overstated his own financial condition and within a year defaulted to his primary lender, Crédit Lyonnais, which foreclosed on the studio in 1992. This resulted in the sale or closure of MGM/UA's string of US theaters. On July 2, 1992, MGM-Pathé Communications was again named Metro-Goldwyn-Mayer, Inc. In an effort to make MGM/UA saleable, Credit Lyonnais ramped up production and convinced John Calley to run UA. Under his supervision, Calley revived the Pink Panther and James Bond franchises and highlighted UA's past by giving the widest release ever to a film with an NC-17 rating, Showgirls. Credit Lyonnais sold MGM in 1996, again to Kirk Kerkorian's Tracinda, leading to Calley's departure. In 1999, filmmaker Francis Ford Coppola attempted to buy UA from Kerkorian who rejected the offer. Coppola signed a production deal with the studio instead. In 1999, UA was repositioned as a specialty studio. MGM had just acquired The Samuel Goldwyn Company, which had been a leading distributor of arthouse films. After that name was retired, MGM folded UA into Metro-Goldwyn-Mayer Pictures. G2 Films, the renamed Goldwyn Company and MGM's specialty London operations, was renamed United Artists International. The distributorship, branding, and copyrights for two of UA's main franchises (Pink Panther, and Rocky) were moved to MGM, although select MGM releases (notably the James Bond franchise co-held with Danjaq, LLC and the Amityville Horror remake) carry a United Artists copyright. The first arthouse film to bear the UA name was Things You Can Tell Just by Looking at Her. United Artists hired Bingham Ray to run the company on September 1, 2001. Under his supervision, it produced and distributed many art films, including Bowling for Columbine, 2002's Nicholas Nickleby, and the winner of that year's Academy Award for Best Foreign Language Film, No Man's Land; and 2004's Undertow, and Hotel Rwanda, a co-production of UA and Lions Gate Entertainment, and made deals with companies like American Zoetrope and Revolution Films. Ray stepped down from the company in 2004. In 2005, a partnership of Comcast, Sony and several merchant banks bought United Artists and its parent, MGM, for $4.8 billion. Though only a minority investor, Sony closed MGM's distribution system and folded most of its staff into its own studio. The movies UA had completed and planned for release—Capote, Art School Confidential, The Woods, and Romance and Cigarettes—were reassigned to Sony Pictures Classics. In March 2006, MGM announced that it would return again as a domestic distribution company. Striking distribution deals with The Weinstein Company, Lakeshore Entertainment, Bauer Martinez Entertainment, and other independent studios, MGM distributed films from these companies. MGM continued funding and co-producing projects released in conjunction with Sony's Columbia TriStar Motion Picture Group on a limited basis and produced tent-poles for its own distribution company, MGM Distribution. Sony had a minority stake in MGM, but otherwise MGM and UA operated under the direction of Stephen Cooper (CEO and minority owner of MGM). On November 2, 2006, MGM announced that Tom Cruise and his long-time production partner Paula Wagner were resurrecting UA. This announcement came after the duo were released from a fourteen-year production relationship at Viacom-owned Paramount Pictures. Cruise, Wagner and MGM Studios created United Artists Entertainment LLC and the producer/actor and his partner owned a 30 percent stake in the studio, with the approval by MGM's consortium of owners. The deal gave them control over production and development. Wagner was named CEO, and was allotted an annual slate of four films with varying budget ranges, while Cruise served as a producer for the revamped studio and the occasional star. UA became the first motion picture studio granted a Writers Guild of America, West (WGA) waiver in January 2008 during the Writers' Strike. On August 14, 2008, MGM announced that Wagner would leave UA to produce films independently. Her output as head of UA was two films, both starring Cruise, Lions for Lambs and Valkyrie. Wagner's departure led to speculation that a UA overhaul was imminent. Since then, UA has served as a co-producer with MGM for two releases: the 2009 remake of Fame and Hot Tub Time Machine—these are the last original films to date to bear the UA banner. A 2011 financial report revealed that MGM reacquired its 100 percent stake in United Artists. MGM stated that it might continue to make new films under the UA brand. On September 22, 2014, MGM acquired a 55 percent interest in One Three Media and Lightworkers Media, both operated by Mark Burnett and Roma Downey and partly owned by Hearst Entertainment. The two companies were consolidated into a new television company, United Artists Media Group (UAMG), a revival of the UA brand. Burnett became UAMG's CEO and Downey became president of Lightworkers Media, the UAMG family and faith division. UAMG became the distributing studio for Mark Burnett Productions programming such as Survivor. UAMG was to form an over-the-top faith-based channel. On December 14, 2015, MGM announced that it had acquired the remaining 45 percent stake of UAMG it did not already own and folded UAMG into MGM Television. Hearst, Downey, and Burnett received stakes in MGM collectively valued at $233 million. Additionally, Burnett was promoted to CEO of MGM TV, replacing the outgoing Roma Khanna. The planned over-the-top faith service became a separate entity owned by MGM, Burnett, Downey and Hearst. By August 2018, MGM relaunched the United Artists brand as a digital production and distribution company aimed at creating original motion pictures, television programs, short-form content and digital series as well as building upon MGM's existing IP for distribution across digital platforms. Known as United Artists Digital Studios, the company's projects include mid-form original series Stargate Origins, interactive digital series #WarGames, and scripted series The Baxters (which is also the first for LightWorkers Media) and Weekend at Bernie's. In early October 2018, MGM and Walmart agreed to a partnership for MGM Digital to create exclusive content for Walmart's Vudu and Movies On Us service to begin showing in the first quarter 2019. MGM's and Annapurna Pictures' Mirror distribution venture was rebranded as United Artists Releasing on February 5, 2019, 100 years to the day of United Artists' founding. A majority of UA's post-1952 library is now owned by MGM, while the pre-1952 films (with few exceptions) are now either owned by other companies (such as Turner Entertainment) or are in the public domain. However, throughout the studio's history, UA acted more as a distributor than a film studio, crediting the copyright to the production company responsible. This explains why certain UA releases, such as High Noon (1952) and The Final Countdown (1980), are still under copyright but not owned by MGM. [original research?] The MGM titles which UA distributed from 1973 to 1982 are now owned by Turner. UA originally leased the home video rights to its films to Magnetic Video, the first home video company. Fox purchased Magnetic in 1981 and renamed it 20th Century-Fox Video that year. In 1982, 20th Century-Fox Video merged with CBS Video Enterprises (which earlier split from MGM/CBS Home Video after MGM merged with UA) giving birth to CBS/Fox Video. Although MGM owned UA around this time, UA's licensing deal with CBS/Fox was still in effect. However, the newly renamed MGM/UA Home Video started releasing some UA product, including UA films originally released in the mid-80s. Prior to MGM's purchase, UA licensed foreign video rights to Warner Bros. through Warner Home Video, in a deal that was set to expire in 1991. In 1986, the pre-1950 WB and the pre-May 1986 MGM film and television libraries were purchased by Ted Turner after his short-lived ownership of MGM/UA, and as a result CBS/Fox lost home video rights to the pre-1950 WB films to MGM/UA Home Video. When the deal with CBS/Fox (inherited from Magnetic Video) expired in 1989, the UA released films were released through MGM/UA Home Video. Before the Magnetic Video and Warner Home Video deals in 1980, United Artists had exclusive rental contacts with a small video label called VidAmerica in the US, and another small label called Intervision Video in the UK. for the home video release of 20 titles from the UA library (e.g. The Great Escape, Some Like It Hot, and Hair, along with a few pre-1950 WB titles). United Artists owned and operated two television stations between the years of 1968 and 1977. Legal ID's for the company would typically say "United Artists Broadcasting: an entertainment service of Transamerica Corporation," along with the Transamerica "T" logo. by Gray Television Licensed to Lorain. The call letters stand for United Artists Broadcasting, which founded the station. Kaiser Broadcasting owned a minor stake from 1975 to 1977 following the closure of crosstown WKBF. In 1977, Gaylord Entertainment Company acquired WUAB. Additionally, United Artists Broadcasting also held the permit to KUAB-TV in Houston, Texas, which would have possibly launched sometime around 1969 on channel 20. United Artists also owned one radio station, WWSH in Philadelphia, from 1970 to 1977. UAB/Transamerica left the broadcasting business in 1977 by selling WUAB to the Gaylord Broadcasting Company and WWSH to Cox Enterprises. United Artists Releasing (UAR), formerly Mirror (commonly, given its former use as the third party label), is a film distribution joint venture between Annapurna Pictures, Metro-Goldwyn-Mayer Studios and MGM's Orion Pictures unit with offices in West Hollywood and Annapurna's offices in New York City's Soho neighborhood. The distributor also offers alternative services to the major studios and streaming companies with 10–14 films to be released each year. Mirror was founded as a film distribution joint venture between Annapurna and MGM in December 2017. This marks MGM's return to domestic distribution, in which they expect to have approximately six to eight releases per year starting in March 2018. Annapurna's existing distribution staff would be the initial staff of the joint venture. Films issued by MGM and Annapurna would be distributed respectively under their own names, while films released for third parties would use the Mirror releasing label. Death Wish was MGM's first release by the joint venture on March 2, 2018. Under the initial agreement, the distribution unit reported to MGM and Annapurna on their movies. By the end of January 2019, the distributor released eight titles total. The venture was rebranded as United Artists Releasing on February 5, 2019, 100 years to the day of United Artists' founding. Reasoning behind the move is to better compete against the major studios given their tentpole films that dictate the release calendar. Orion Pictures, an MGM company, would add its distribution staff and films to the venture as part of the change. Pam Kunath, a former Screen Gems executive, was appointed chief operating officer. A board of directors consisting of executives from the partner firms would oversee the three executives running UAR; Kunath, David Kaminow and Erik Lomis, Annapurna's president of marketing and president of distribution, respectively. Missing Link would be the first release under the UAR banner. ^ WB retained a pair of features from 1949 that they merely distributed, and all short subjects released on or after September 1, 1948, in addition to all cartoons released in August 1948. ^ Petski, Denise (July 21, 2017). "MGM Revives 'Stargate' Franchise With 'Stargate Origins' Digital Series & SVOD Platform – Watch The Teaser". Deadline. Retrieved September 13, 2018. ^ Woo, Elaine (September 29, 2011). "Mo Rothman dies at 92; found new audience for Chaplin". Los Angeles Times. Retrieved 2011-10-01. ^ a b Balio, Tino (March 2, 2009). United Artists, Volume 1, 1919–1950: The Company Built by the Stars, Volume 1 (2nd ed.). Madison, Wisconsin: University of Wisconsin Press. p. 29. ISBN 9780299230036. Retrieved September 2, 2017. ^ Cole, Robert J. "M-G-M is Reported Purchasing United Artists for $350 Million". Retrieved 2018-04-26. ^ McNary, Dave (December 14, 2015). "Mark Burnett Named President of MGM Television". Variety. Retrieved September 2, 2017. ^ Siklos, Richard (4 March 2007). "Mission Improbable: Tom Cruise as Mogul". The New York Times. Retrieved 2 October 2017. ^ james, devon (2016-06-02). ""The inmates are taking over the asylum."". devon james. Retrieved 2018-04-26. ^ a b c d e f g h i j k l m n o p q r s t u v w x y z aa "History of Metro-Goldwyn-Mayer Inc". Funding Universe. Retrieved December 20, 2014. ^ "The Formation of Twentieth Century-Fox (20th Century Fox)". www.cobbles.com. Retrieved 2018-04-26. ^ Balio, Tino (March 2, 2009). United Artists: The Company that Changed the Film Industry (1st ed.). Madison, Wisconsin: University of Wisconsin Press. pp. 226–227. ISBN 9780299114404. Retrieved September 2, 2017. ^ "US Sets Up Own Diskery Label". Billboard: 20. October 14, 1957. ISSN 0006-2510. Retrieved September 2, 2017. ^ "About: 1970-1979". EMI Archive Trust. Retrieved October 1, 2017. ^ McNeil, Alex (1996). Total television: the comprehensive guide to programming from 1948 to the present (4th ed.). New York: Penguin Books. p. 886. ISBN 9780140249163. Retrieved September 2, 2017. ^ "Movies from a.a.p. : Programs of quality from quality studios, Warner Bros. features and cartoons, Popeye cartoons". Archive.org. 1957. Retrieved October 1, 2017. ^ Schickel, Richard; Perry, George (September 9, 2008). You Must Remember This: The Warner Bros. Story. Philadelphia. : Running Press. p. 255. ISBN 9780762434183. Retrieved 2 September 2017. ^ Kamp, David (October 2012). "Fifty Years of Bond, James Bond: The Greatest Film Franchise's Biggest Birthday". Vanity Fair. Retrieved October 1, 2017. In 1961, Broccoli worked his connections to secure a meeting in New York with Arthur Krim, the head of United Artists. Krim agreed to a budget of just over a million dollars for a James Bond movie. ^ a b Medavoy, Mike; Young, Josh (June 25, 2013). You're Only as Good as Your Next One: 100 Great Films, 100 Good Films, and 100 for Which I Should Be Shot. New York: Simon and Schuster. pp. 85–86. ISBN 9781439118139. Retrieved October 1, 2017. ^ Welkos, Robert W. "'Heaven's Gate': The film flop that reshaped Hollywood". latimes.com. Retrieved 25 December 2018. ^ Cole, Robert J. (May 16, 1981). "M-G-M is Reported Purchasing United Artists for $350 Million". The New York Times. Retrieved August 17, 2015. ^ a b c d e f g Fleming, Mike Jr; Busch, Anita (September 22, 2014). "MGM Buys 55% Of Roma Downey And Mark Burnett's Empire; Relaunches United Artists". Deadline Hollywood. Retrieved November 4, 2014. ^ a b Fabrikant, Geraldine (August 8, 1985). "Turner Acquiring MGM Movie Empire". The New York Times. Retrieved November 4, 2014. ^ "Handle With Care". American Film. Winter 1980. ^ Siskel, Gene (May 16, 1982). "Hellow, Sweet Art: Small Films Big Success in Chicago". Chicago Tribune. p. 141. (Subscription required (help)). ^ Harmetz, Aljean (July 13, 1982). "Begelman Removed as Chief of United Artists". The New York Times. Retrieved October 1, 2017. ^ "700 Bankers Trust Workers To Be Shifted to Jersey City". The New York Times. March 31, 1983. Retrieved August 17, 2015. ^ a b Prince, Stephen (2000). A New Pot of Gold: Hollywood Under the Electronic Rainbow, 1980 1989 (Paperback ed.). Berkeley: University of California Press. pp. 14–16. ISBN 9780520232662. Retrieved September 2, 2017. ^ Dellugach, Al (November 12, 1985). "Weintraub Is New Chief of United Artists". Los Angeles Times. Retrieved November 4, 2014. ^ "New Head For United Artists". The New York Times. November 20, 1985. Retrieved January 26, 2015. ^ Harris, Kathryn (April 29, 1986). "Rich Resigns From Lorimar to Become Chairman of UA". Los Angeles Times. Retrieved January 26, 2015. ^ a b c Bart, Peter (May 1990). Fade Out: The Calamitous Final Days of MGM (1st ed.). New York: Morrow. pp. 236–238. ISBN 9780671710606. Retrieved September 2, 2017. (Subscription required (help)). ^ a b c Parsons, Patrick R. (April 5, 2008). Blue Skies: A History of Cable Television. Philadelphia: Temple University Press. p. 507. ISBN 9781592137060. Retrieved 1 October 2017. (Subscription required (help)). ^ Stefoff, Rebecca (1992). Ted Turner, Television's Triumphant Tiger. Ada, Oklahoma: Garrett Educational Corp. p. 55. ISBN 9781560740247. Retrieved October 1, 2017. (Subscription required (help)). ^ Storch, Charles (May 7, 1986). "Turner May Sell Equity In Company". Chicago Tribune. Pqasb.pqarchiver.com. Retrieved December 15, 2011. ^ Gendel, Morgan (June 7, 1986). "Turner Sells The Studio, Holds on to the Dream". Los Angeles Times. Retrieved December 15, 2011. ^ Balio, Tino (March 2, 2009). United Artists, Volume 2, 1951–1978: The Company That Changed the Film Industry. Madison, Wisconsin: University of Wisconsin Press. p. 343. ISBN 9780299230135. Retrieved 2 September 2017. ^ a b c Fabrikant, Geraldine (June 7, 1986). "Turner To Sell Mgm Assets". The New York Times. Retrieved January 26, 2015. ^ "Turner, United Artists Close Deal". Orlando Sentinel. United Press International. August 27, 1986. Retrieved September 20, 2013. ^ Fabrikant, Geraldine (November 29, 1989). "Turner Buying MGM/UA". The New York Times. Retrieved October 2, 2014. ^ Bart, Peter (April 10, 2013). "MGM: Sometimes a Roaring Silence Is Best". Variety. Retrieved October 1, 2017. ^ "United Artists restructuring by MGM". CNNMoney. June 7, 1999. Retrieved 2015-01-26. ^ "DAILY NEWS **UPDATE**: Bingham Ray and Chris McGurk on the New UA; Solondz and Lipsky Stir "Storytelling" Rating Buzz". IndieWire. August 6, 2001. Retrieved April 7, 2019. ^ Hernandez, Eugene (January 9, 2001). "Shakeup at United Artists; Bingham Ray Exits Company". IndieWire. Retrieved April 7, 2019. ^ "MGM Puts Cruise in Charge of New United Artists". USA Today. November 2, 2006. Retrieved May 20, 2010. ^ Petrecca, Laura; Lieberman, David (November 2, 2006). "Tom Cruise, producing partner cut a deal with United Artists". Zap2it. Retrieved October 1, 2017. ^ a b c Fritz, Ben (March 23, 2012). "MGM regains full control of United Artists". Los Angeles Times. Retrieved January 26, 2015. ^ "SHOCKER! WGA To Announce Side Deal With Tom Cruise's United Artists; Now Studio Moguls Mad at MGM's Sloan". Deadline Hollywood. January 4, 2008. Retrieved May 20, 2010. ^ a b Fleming, Michael (13 August 2008). "Paula Wagner leaves UA". Variety. Retrieved 14 August 2008. ^ Cieply, Michael (April 23, 2008). "The Nazi Plot That's Haunting Tom Cruise and United Artists". The New York Times. Retrieved April 29, 2008. ^ "Valkyrie (2008)". Box Office Mojo. Retrieved April 13, 2009. ^ Highfill, Samantha (17 January 2015). "MGM is launching the United Artists Media Group (again)". Entertainment Weekly. Retrieved May 11, 2015. ^ McNary, Dave (December 14, 2015). "Mark Burnett Named President of MGM Television". Variety. Retrieved December 14, 2015. ^ Bond, Paul (August 14, 2018). "MGM's Revenue on the Rise, But Net Income Struggles". The Hollywood Reporter. Retrieved September 13, 2018. ^ Spangler, Todd (October 8, 2018). "Walmart's Vudu Orders MGM Shows for Free, Ad-Supported Video Service". Variety. Retrieved October 9, 2018. ^ a b c d e f Donnelly, Matt (February 5, 2019). "Annapurna, MGM Joint Distribution Venture Rebrands as United Artists Releasing". Variety. Retrieved February 5, 2019. ^ Fabrikant, Geraldine (May 31, 1988). "For MGM/UA, Bidders Are Scarce". The New York Times. ^ Bins, Chuck (December 23, 1980). "VCR revolution to provide wide selection for TV viewers". New Castle News. p. 8. ^ "This Month" (pdf). Panorama. October 8, 2013. Retrieved October 1, 2017. ^ Kopp, George (October 4, 1980). "Europe Moves Forward in Copyright Levy Push". Billboard: 87. ISSN 0006-2510. Retrieved October 1, 2017. ^ a b c d e Fleming Jr, Mike (February 5, 2019). "MGM, Annapurna Set Joint Venture To Theatrically Distribute Under United Artists Releasing Banner". Deadline. Retrieved February 6, 2019. ^ a b McNary, Dave (October 31, 2017). "MGM, Annapurna Form U.S. Distribution Partnership". Variety. Retrieved February 6, 2019. ^ a b c d Galuppo, Mia (February 5, 2019). "MGM, Annapurna Team for Distribution Label United Artists Releasing". The Hollywood Reporter. Retrieved February 6, 2019. ^ "MGM Ramps Up Theatrical Distribution & Pacts With Annapurna; Easy Set Up To Roll Out Next Bond Film". ^ Jr, Mike Fleming; Lodderhose, Diana (February 11, 2017). "MGM Headlocks World Rights To 'Fighting With My Family' In $17.5M Deal: Berlin". Deadline. Retrieved February 7, 2019. ^ Ellingson, Annlee (February 5, 2019). "MGM, Annapurna revive United Artists for joint distribution venture". L.A. Biz. American City Business Journals. Retrieved February 14, 2019. ^ D'Alessandro, Anthony; D'Alessandro, Anthony (2019-02-15). "'Bond 25' Looks To Shake Up Easter 2020". Deadline. Retrieved 2019-02-16. ^ "'Legally Blonde 3' Sets Valentine's Day 2020 Release Date". June 7, 2018. Retrieved June 12, 2018. Bach, Steven. Final Cut. New York: Morrow, 1985. Balio, Tino. United Artists: The Company Built by the Stars. Madison: University of Wisconsin Press, 1976. Balio, Tino. United Artists: The Company That Changed the Film Industry. Madison: University of Wisconsin Press, 1987. Berg, A. Scott. Goldwyn. New York: Alfred A. Knopf, 1988. Gabler, Neal. An Empire of Their Own: How the Jews Invented Hollywood. New York: Crown Publishers, 1988. Schickel, Richard. D.W. Griffith: An American Life. New York: Simon & Schuster, 1983. Thomson, David. Showman: The Life of David O. Selznick. New York: Alfred A, Knopf, 1992. Wikimedia Commons has media related to United Artists. United Artists Corporation Records 1919–1965 — at the Wisconsin Center for Film and Theater Research.